J.Co Donuts & Coffee is now opened at Pavilion on Jalan Bukit Bintang... as i previously announced on my blog on the day of the launching of Pavilion, yes i was there to witness the opening and visit the grandeur of this shopping excellence that makes Malaysia another location to hit by tourists who seeks for excellent shopping experiences. 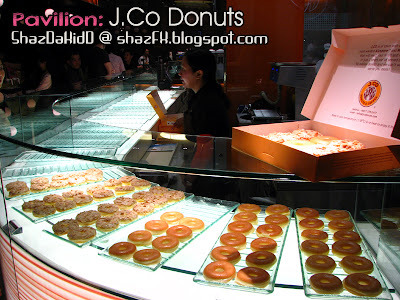 Was there on the day of the opening, sorry that this update had to come in so late... but i did summarise in one of my updates on the opening day that Pavilion carries certain brands and one of them is J.Co Donuts from Indonesia. Before i go any further... 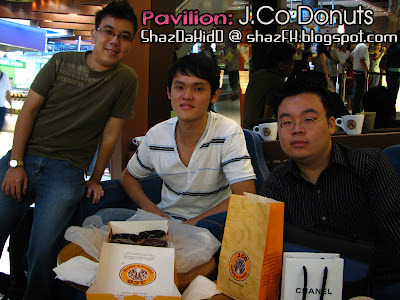 I've worked out a simple deal with J.Co Donuts & Coffee - soon after Hari Raya, i will be organising a small little gathering at J.Co Donuts & Coffee for some of my friends and blog readers to have a few bites and drink at J.Co for FREE. Let's wait for after raya shall we... Thx. 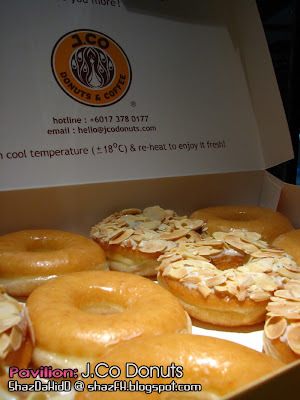 to J.Co Donuts & Coffee!!! 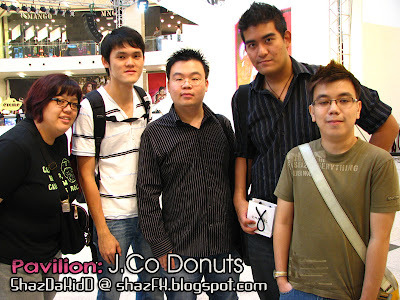 On the day of the launching, i met up with the nice people from J.Co donuts who briefed me all about J.Co donuts, its history and products. Managed to snap a few photos of the donuts and went back with a happy smiling face because i got 2 dozen of donuts for free! Thx J.Co!!! 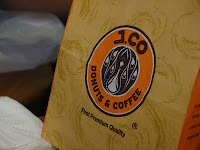 J.Co Donuts are awesome...i simply love their donuts and the different flavors such as TiraMissU, Don Mochino, CocoLoco and etc... They have their very own signature ice blended drinks too and get a free Glazy Donut upon ordering an Ice-Blended drink, if you're lucky upon queuing for donuts, you may get a glazy donuts to eat and stop your mouth from watering furthermore! 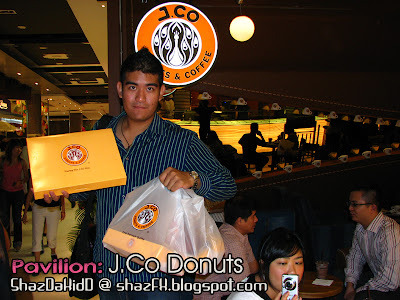 One of J.Co's staff showing 2 of its best sellers the Almond Donut (sorry i forgot the name), and Glazy Donut... This box can fit 1 dozen that's 12...pieces of donuts! That's me looking happy with my 2 dozen of Donuts to be brought home and share with family!!! Thanks J.Co!!! 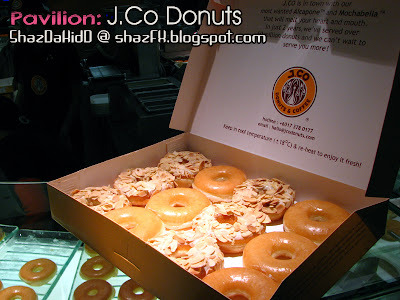 2 weeks ago, i went to J.Co Donuts at Pavilion again, this was like for the upteenth time! But i went with a few friends namely James, Joshua and William. Get a dozen of donuts... its cheaper than buying one by one if you were to go in a group! Was at Pavilion 2 weeks ago, met up with Sandra, Joshua, William and James... there was a fashion show that was going on!!! Heheh... what a coincidence! 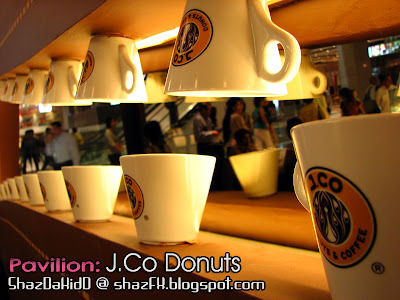 PS: I am not sponsored by J.Co Donuts & Coffee or what... i wrote this blog update upon my personal review and taste of the selections of Donuts that J.Co has to offer comparing it with other local brands and other donut companies in Malaysia. And yes i do pay for my own donut when i came over for a bite sometimes and i did get some donuts for free to share with my colleagues!!! 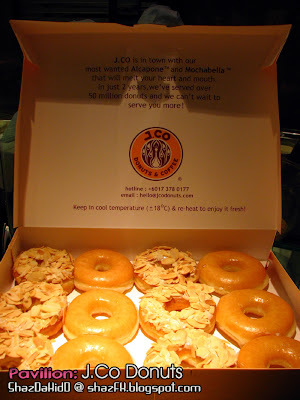 Haven't tried J.Co before but I think Krispy Kreme has a much longer history for all thing donut since it's around for like 70 years already. Another Saturday...it's a brand new day!! !